What Is a Flavored Cigar? 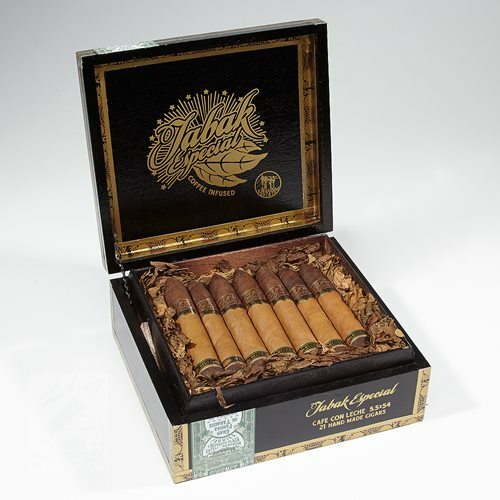 A flavored cigar is a cigar made with flavored/specially treated tobacco leaves. Tobacco leaves can take on flavor and/or scent from the surrounding air. If the leaves are aged or fermented in a controlled room that has let’s say …orange blossoms in it. The tobacco leaves will absorb the aroma from the air and store it in the leaf. When this “orange” flavored tobacco leaf is burned, it will smell and taste “orangey”. You can use many different scented plants/flowers to infuse spice or fragrance into tobacco leaves. It’s quite ingenious. Flavors can also come from liquids like rum, scotch, whiskey, tequila, coffee, etc. If the liquid is atomized in a controlled room, tobacco leaves will absorb the liquor fumes and take on the smell and flavor. Some cigar companies age tobacco inside used rum barrels. The leaves are left in the empty rum barrels for up to 30 days. Nothing is finer than a cigar and some rum. ACID Cigars from Drew Estate are prime examples of flavored cigars. They use special Aroma Rooms to infuse flavors into the tobacco leaves. They use over 150 different herbs, oils and botanicals in these aroma rooms. The tobacco ages in these rooms and soaks up the rich aromas. There is nothing like an ACID cigar. Sweet and enchanting. Want to smoke a Iced Mocha? Try a Drew Estate Tabak Especial Cafe con Leche. It’s an infused premium coffee stick perfect for a morning smoke amidst a fall sunrise. This tasty cigar is brought to you by the makers of Acid Brand cigars. Acid brand cigars are very popular and highly rated. If you enjot Drew Estate cigars then you might want to try one of these specialty sticks. They are very well balanced, well blended and mild bodied. If you like a mild smoke but with lots of flavor, the Especial fits the bill. Coffee drinkers will love this smoke. The infusion of Coffee and Creme is perfect…not too strong and not weak. Drew Estate is the King of infused cigars. No one else has duplicated the process nor the taste. Each one is a totally different experience. Just smell the wrapper and then close your eyes. It’s delightful. These are ultra premium hand rolled beauties with nothing but top quality tobacco. Drew Estate is one of the top producers of Nicaraguan cigars. You’ll find everything from traditional blends to specialties like Cafe con Leche and the Red Eye. The Cafe con Leche combines the flavors of Maduro and Connecticut which swirls to the tune of hearty espresso notes with a very smooth french roast twist. The draw is very smooth with an even burn. Nice construction. Aroma is amazing. The Red Eye is more popular but the Cafe con Leche is no slouch. Nice packaging huh? These are real beauties with a wonderful presentation. They are very affordable at $9.20 for a single stick.